Once a person becomes a contact in your Campus account you can start marketing to them in a really focused, effective, and specific way. During this period you'll get them scoring points, and start moving them through your funnel. A funnel is a theoretical representation of the stages your contacts are likely to go through before committing to buying your products and services. A contact starts at the top of your funnel, is marketed to, interacts with that marketing, shows an interest in you, and moves down towards the bottom of the funnel where they are more likely to buy from you because they have become a hotter prospect. This is the 1st stage of the marketing funnel and is likely to be the level that most new contacts start at. This is the 2nd stage of the marketing funnel. Leads are more valuable to you than Prospects as they are more likely to buy from you. This is the 3rd and final stage of the marketing funnel. Opportunities are even better prospects than Leads and are your hottest prospects. They are the most likely category of your contacts to buy from you. Go to your Settings module (by clicking on the Settings item in the dropdown menu underneath the user picture top right of your screen). 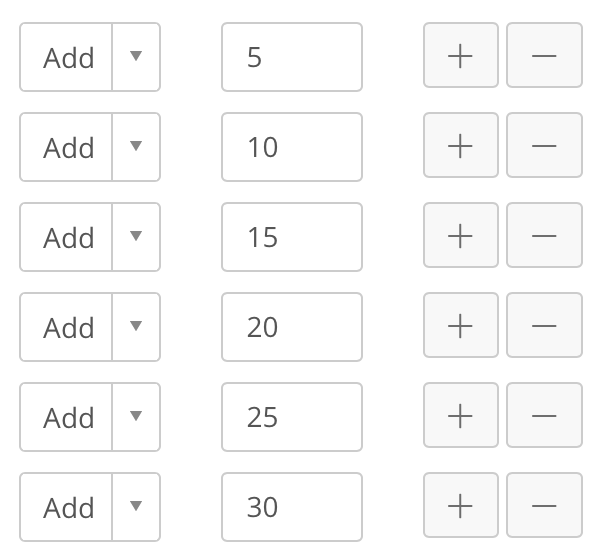 Then select the Contacts item in the submenu and then the Marketing Funnel item in the dropdown. You'll then be fired over to the MarketingFunnel Settings page. Now scroll down to the Funnel Point Thresholds section. Here you can assign the number of points a contact needs to become a Lead and the number of points a contact needs to become an Opportunity. When a contact visits the pages of your website. When a contact opens your marketing emails. When a contact clicks on your marketing emails. When a contact corresponds with you by phone or email. When a contact fills out one of your lead generation forms. When a contact receives a quote. It's up to you to tell Campus how many points each activity is worth to you. For example, you may think that a contact filling out a lead generation form on your website shows a greater commitment to buying from you than a contact that simply visits your 'About Us' page. Both are notable actions that should have an effect on a contact's position in your sales funnel but one of them carries greater 'weight'. So, therefore, you might assign 10 points to any Contact that fills out a lead generation form and just 2 points to any Contact that visits your 'About Us' page. To set this scroll down to the Funnel Points Scoring section. In the first dropdown you can select the primary action that will result in a point score. You then add information to the action to make it specific. Then finally over on the right hand side you assign the actual number of points you want to add or deduct for each particular action. When saving your points you have two options: Save or Recalculate. If you hit Save the changes to your points settings will take place from then on. If you hit Recalculate then Campus will trawl back through all your contacts' activity and reassign points historically. Campus recognizes that in reality you wouldn't want a contact to remain stuck in your sales funnel indefinitely. For example, you may have engaged with a contact in such a way that they've moved into the Opportunities category of your sales funnel. But, then, despite your best efforts to convert them into a purchaser they go off the radar for several weeks. Now, in reality, this contact, due to their radio silence, should no longer be classed as an Opportunity, and should be bumped back up to the top of the sales funnel into the Followers category. So, you can specify the length of time after which the contact becomes inactive (i.e. doesn't score any more points) that their points are reset to zero and they get bumped to the Prospects category. 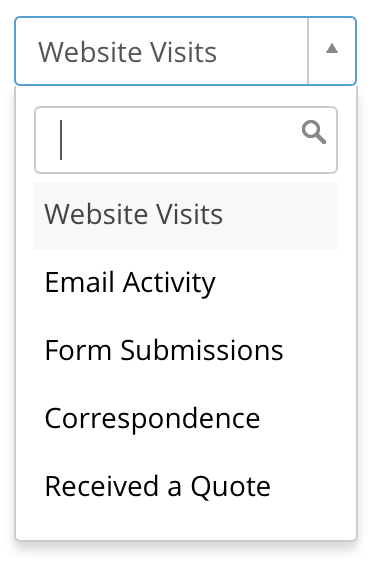 While you can easily see whether your Contact is a Follower, Lead, or Opportunity by heading over to your Marketing Funnel; you can also manage each individual Contact's points by scooting on over to their Contact Page and clicking on the View Points button. 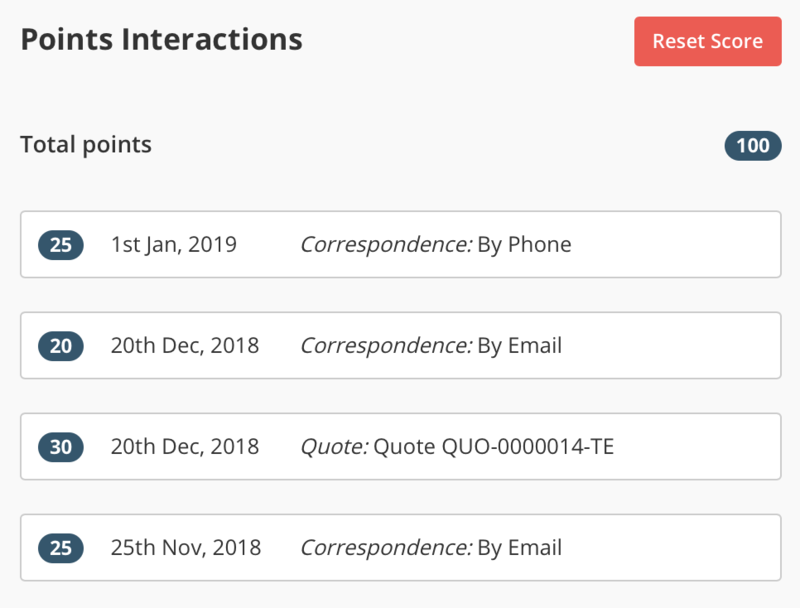 This fires a slide in pane where you can clearly see every interaction your Contact has had and how many points they have generated from these interactions, as well as allowing you to completely reset that Contact's points by clicking the Reset Score button.